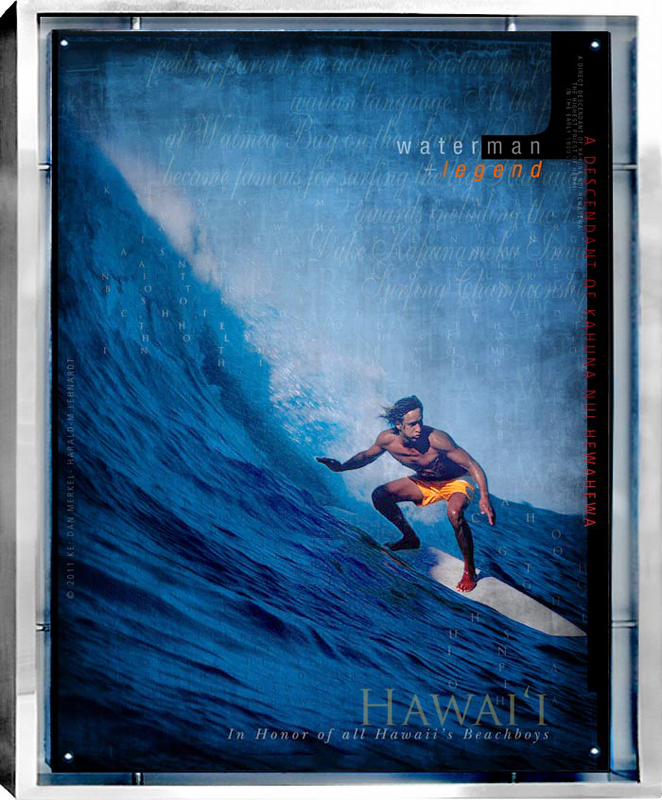 The collaboration of ‘Surf Photography Pioneer’ and Emmy-Award-winning Photographer Dan Merkel and Hawaiian-resident/ German-born artist and typographer Harald-M. Lehnardt is a modern day adaptation to tell the tale of surfing’s golden days. As artists, Lehnardt and Merkel share the same degree of passion and enthusiasm, the ability and commitment to synthesize dynamic and compelling compositions: elegantly integrated, interdisciplinary works of art. 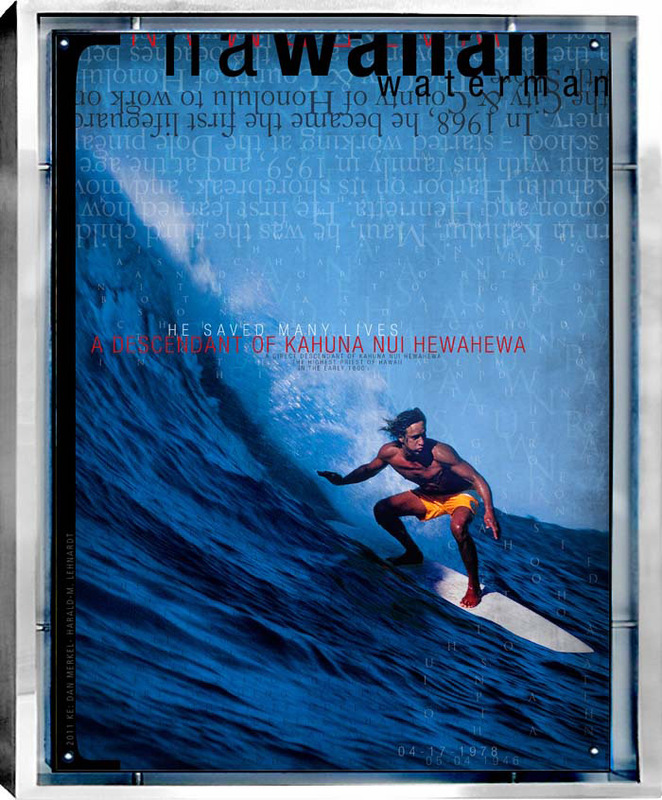 Dan Merkel’s iconic photo of Hawaiian patriarch and legendary waterman Eddie Aikau, graced the cover of the 25th anniversary 'The Quiksilver in Memory of Eddie Aikau' Big Wave Invitational' and captured a piece of Hawaiian History. Eddie Aikau was an Hawaiian patriarch and legendary North Shore lifeguard and waterman who sacrificed his life to save others. The real-life drama is that in 1978, at age 31, Edward Ryan Makua Hanai Aikau volunteered to crew a 30-day, 2,500 mile journey between Hawaii and Tahiti on the double-hulled voyaging canoe, ‘Hokulea’. The canoe left the Hawaiian Islands on March 17, but developed a leak and capsized about 12 miles south of Molokai. Eddie paddled toward Lanai on his surfboard to get help, but was never seen again. The rescue search was the largest in Hawaii’s history; the rest of crew was rescued by the U.S. Coast Guard. Over time, Eddie’s sacrifice has reached mythic status and his legacy will always be remembered. He was a true symbol of Aloha. 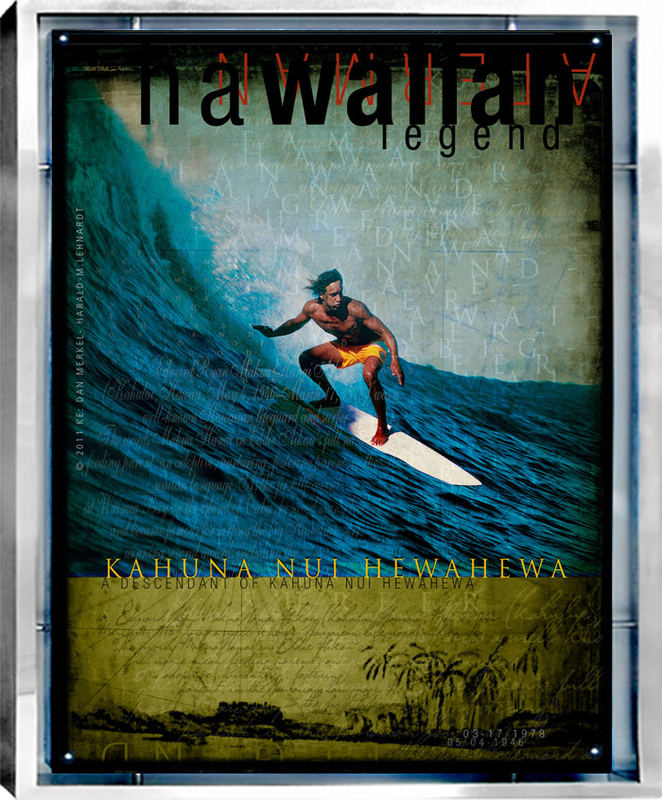 On November 2, 2013 we were mourning the passing of a dear friend and one of Hawaii's Surfing Legends Buttons Kaluhiokalani due to complications related to cancer. 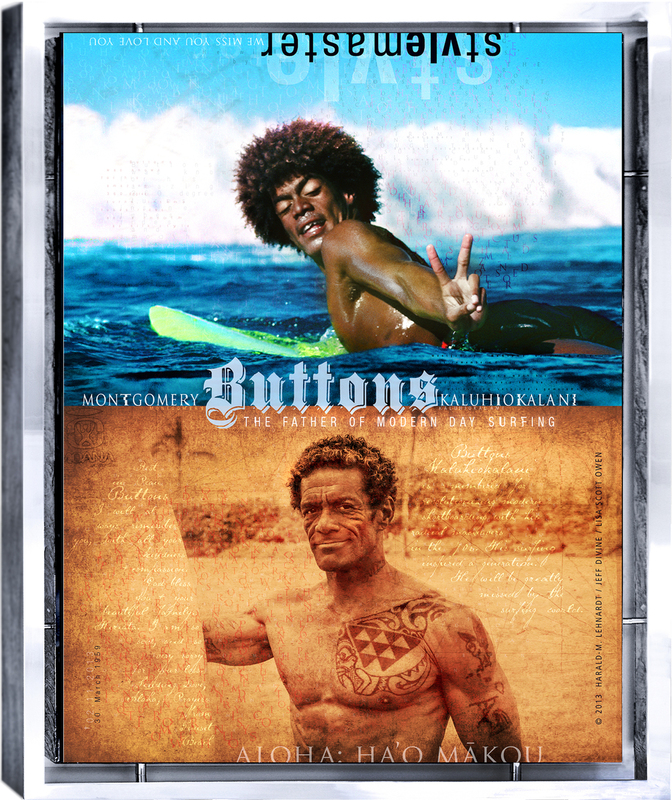 As one of the greatest performance innovators surfing has ever known, Buttons is remembered for revolutionizing modern shortboarding with his radical maneuvers in the 70's. His surfing inspired a generation. He will be greatly missed by the surfing world. I will always remember him for his kindness and his compassion. A great man, with a great smile and a heart of gold, a great performer and also a family man. He is survived by his wife, eight children and nine grandchildren. As a tribute, I wanted to create something unique and authentic that captured his heart and soul: beautiful and iconic. With full support of Jeff Divine and Lisa Scott Owen, I worked very hard to combine both of these iconic photographs in one of my poetic text/image compositions and I absolutely love what I created. I composed a similar tribute with Brian Bielmann's shot of Andy Irons after he passed away 3 years ago .. also on November 2nd. May they both catch up in heaven .. and maybe George Ramos (another NorthShore Legend that passed away this summer) will keep them busy paddling; I know they all are in good hands. Aloha.